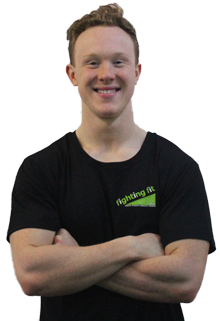 Cooper is a new addition to Fighting Fit PT, having joined the team in 2018. Cooper combines his personal fitness experience with evidence-based training methods to find tailored training solutions for each client. From total beginners through to serious amateur athletes, Cooper takes the time to assess each client before creating a customised training program. His programming philosophy takes many things into account, including individual fitness levels, natural ability, and the personal preferences of each client. Cooper believes in communication at every stage in order to meet measurable goals in a way that is effective and efficient. For clients with a new commitment to fitness, Cooper emphasises education and takes nothing for granted. Before creating an individual fitness plan, he will teach clients about how the body works and the impact that each exercise has on different muscle groups. This clear and well defined plan helps people to achieve their fitness, strength and physique goals. When it comes to amateur athletes and serious fitness enthusiasts, Cooper blends his own personal Powerlifting experience and efficient programming with the latest in exercise physiology research. By enabling his clients to achieve their fitness goals and reach their performance targets, he helps them to push through their limitations and redefine their expectations. Despite his dedication to discipline and intense approach to fitness, Cooper has a relaxed and easy-going personality. Make no mistake though, he takes his training and nutrition very seriously and thoroughly enjoys working with other people who have a similar level of commitment and dedication. At the end of the day, Cooper is dedicated to helping other people reach their fitness goals so that they can become the best possible version of themselves.